These days in Southern Minnesota, it's hard to find any fields that aren't planted with genetically modified corn or soybeans. While GMO crops are quickly taking over the landscape in the United States and Canada, not all countries have embraced these questionable crops. 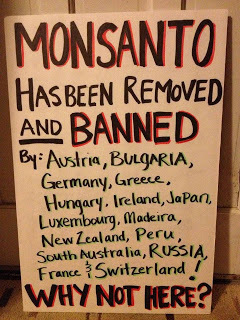 Here's a list of countries (and U.S. counties) that have banned genetically modified crops in one way or another. In the United States: Only the California counties of Mendocino, Trinity and Marin have successfully banned GM crops. Voters in other Calilfornia counties have tried to pass similar measures but failed. In Australia: Several Australian states had bans on GM crops but most of them have since lifted them. Only South Australia still has a ban on GM crops, though Tasmania has a moratorium on them until November of 2014. In Japan: The Japanese people are staunchly opposed to genetically modified crops and no GM seeds are planted in the country. However, large quantities of canola are imported from Canada (which is one of the world's largest producers of GM canola) and there is now GM canola growing wild around Japanese ports and roads to major food oil companies. Genetically modified canola such as Monsanto's Roundup Ready canola have been found growing around 5 of the 6 ports that were tested for GM contamination. In New Zealand: No GM foods are grown in the country. In Germany: There is a ban on the cultivation or sale of GMO maize. In Ireland: All GM crops were banned for cultivation in 2009, and there is a voluntary labeling system for foods containing GM foods to be identified as such. In Austria, Hungary, Greece, Bulgaria and Luxembourg: There are bans on the cultivation and sale of GMOs. In France: Monsanto's MON810 GM corn had been approved but its cultivation was forbidden in 2008. There is widespread public mistrust of GMOsthat has been successful in keeping GM crops out of the country. In Madeira: This small autonomous Portugese island requested a country-wide ban on genetically modified crops last year and was permitted to do so by the EU. In Switzerland: The country banned all GM crops, animals, and plants on its fields and farms in a public referendum in 2005, but the initial ban was for only five years. The ban has since been extended through 2013. In India: The government placed a last-minute ban on GM eggplant just before it was scheduled to begin being planted in 2010. However, farmers were widely encouraged to plant Monsanto's GM cotton and it has led to devastating results. The UK's Daily Mail reports that an estimated 125,000 farmers have committed suicide because of crop failure and massive debt since planting GM seeds. In Thailand: The country has zigzagged in its support and opposition of GM crops. The country had widespread trials of GM papayas from Hawaii but reversed its plans when the seeds got wild and began contaminating nearby crops. Several countries such as Japan moved to restrict the importation of Thailand's papayas as a result, not wanting to import any GM foods. Thailand is currently trying to embrace both sides -- producing organic foods for some countries at a high price while moving towards embracing more and more GM crops. The country has also tried declaring some areas GMO-free zones in order to encourage other countries to trust their foods. What countries have embraced GM crops? The U.S. now grows mostly GM varieties of corn, canola and soy. Hawaii now grows GM papayas. Approvals have also been given for GM alfalfa, zucchinis, beet sugar and tomato varieties, though not all are currently being grown. A recent attempt to approve GM salmon was defeated. China is one of the largest producers of GM crops. Germany, Sweden and the Czech Republic are approved for growing GM potatoes. Finland's government and population is receptive to GM foods. None are currently grown in the country, however, because no approved GM crops are suitable for the country's growing conditions. The Zambian government has launched a campaign to get the public to support GM technology. Canada has widespread GM crop usage. Nearly all Canadian canola is GM, as is a large portion of the country's soy and corn. Prince Edward Island tried to pass a ban on GMO cultivation but failed, and GM crops in the region are currently increasing. Spain currently grows GMO maize (about 20% of the country's maize is GM). The Czech Republic, Slovakia, Portugal, Romania and Poland all grow some GMO maize. The Phillipines grow GM crops. The European Union (EU) has approved the cultivation of many GM crops (including potatoes and maize) but individual countries are able to opt out from growing them. However, most EU countries are not permitted to reject the sale of GM foods. South Africa is growing an increasing number of GM crops. Britain officially supports GM crops and has trials of GMOs like potatoes planted. However, there is widespread public distrust of the crops and Prince Charles has been a vocal opponent of GMOs. South America has widespread planting of GM crops. As mentioned above, Thailand is alternately embracing and rejecting GM crops. India also has widespread GM cotton use. Also mentioned above, the widespread planting of Monsanto's GM cotton has led to tragedy throughout India. The Indian government even banned conventional seeds from many government seed banks in an attempt to please Monsanto (in return, the country was given International Monetary Fund loans to help its economy) and slow the nation's poverty rates. An estimated 1,000 farmers commit suicide each month in the country as a result of the crop failure and debt caused by planting the GM seeds. Farmers were convinced to spend what was often 1,000 times the cost of conventional seed on the "magic seeds" after listening to Monsanto's promises of increased yields and resistence to pests. Despite the promises, the crops were often destroyed by bollworms. In addition, the farmers weren't warned that the crops would require twice as much water as conventional cotton, leading to many crops drying up and dying. The "terminator" seeds also must be purchased again every year. For farmers used to saving seed from year to year, this was often a final financial blow that led to insurmountable debt. The variation in each country's laws and views regarding GMOs has led to complications when it comes to exporting foods. For example, Thailand has been working to reassure other countries about the safety of its food but recently had its canned tuna rejected by Greece and the Netherlands after testing showed GM ingredients. The tuna was packed in soybean oil imported by the United States, where most soy is genetically modified. Some Americans are now looking for foods like canola oil and soy products that are not grown in the United States, thinking that it's a way to avoid GM foods. This is obviously not a good idea. It's important not to assume that just because a food was not produced in the United States, it's not genetically modified. Until consumers have the right to labeling informing us of which foods contain GM ingredients, it's important to be aware of which countries are now growing GM foods and which foods are produced.